TRichView supports multilevel lists. List text can include numbering from previous levels. A legal-style numbering is supported as well. List numbering is incremented automatically. You can define a starting value for a list level, or reset numbering to the specified value. TRichView follows Microsoft Word 97+ model of numbering: list items are numbered throughout the document, even if there are unnumbered paragraphs between them. TRichView supports right-to-left text flow. In RTL paragraphs, list markers are displayed on the right side. RichView Actions provide a user interface for applying and customizing list styles. 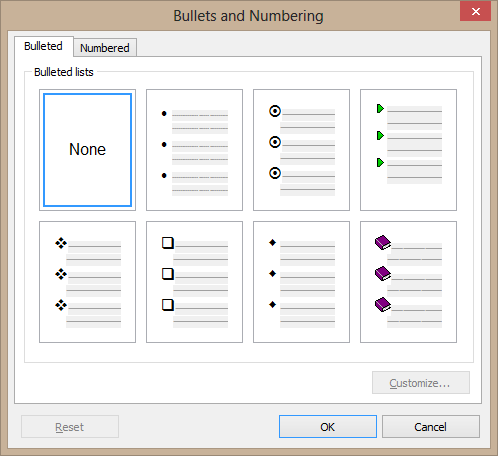 an HTML-style dialog, allowing to choose from bullets an numbering types available in HTML.